If you have ever thought about working as a bartender full or part time, here is some basic information. Want to get into bartending? Bartending jobs can be very profitable. According to Indeed.com a national job listing web site, the average bartender can earn up to $66,000 annually. Bartenders work for a salary and tips. The tips can often be substantial. One of the great things about bartending is that in a short time you can professionally trained and ready to work. Bartending requires public contact. The best bartenders like to deal with people. A major portion of a bartender’s income comes from the tips from customers and good customer service skills are important. In many states you have to be 21 years or older to purchase alcoholic beverages, many states allow bartenders to be 18 years old to bartender. In New York and New Jersey it’s 18. There are many different work schedules for bartenders. Bartenders are needed anytime an establishment is open for business, Evening and weekend schedules are the most frequent but day schedules also exist. If you’re looking for a part time job, there are many weekend opportunities. Bartending can be hard work. Bartenders stand for extended periods of time, and sitting isn’t allowed during shifts. Bartending can involve lifting and stocking cases of beer, wine, and liquor. 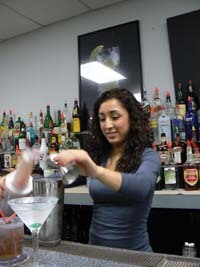 If you are looking to start a new career in Bartending, then attending a qualified bartenders school is a must. Learn how to bartend at our American Bartending Schools with locations in New York, New Jersey and Palm Springs. I’m not sure how accurate that average income number is. You can’t really take a national average because a bartender in Las Vegas will clearly be making much more than a bartender in a suburb of Cleveland. The job will also be a lot more hectic, but that is beside the point. Plus the majority of bartenders’ income comes in tips. Which means that a big chunk of their earnings can be in cash. And lets be honest…many people don’t really report their cash income (or at least not fully). I don’t believe that number to be very useful. Next Next post: Want to Learn Bartending?